"...I was determined to confront that fear"
You’re at a crossroads in your life. You joined the military, served your country proudly and returned home to trade in your uniform for life as a civilian. Now, you are wondering how to transition back into mainstream society. How do you overcome the fears, both real and imagined, you are encountering? How do you overcome the loss of camaraderie and family you experienced? How do you learn to function in society when so many things have changed? How do you explain to your loved ones the pain and isolation you feel? Upon returning home, I realized how truly fortunate I am to be a United States citizen. I visited many countries, saw the environment and substandard living conditions, the limitations imposed by local governments abroad, and the poverty levels; I realized I have much to be thankful for. Not only that, this experience instilled in me a sense of responsibility to assist in my community. To help others that are less fortunate than I am. But my transition home was difficult. The change from a structured work environment I had lived in for most of my adult life, not to mention I was a product of military parents, was an immediate challenge. Memories from sexual abuse I encountered while in the military and prior to my military service were starting to surface. I had no clear direction or plan for my future. I felt lost and depressed. I attempted to find my way by working in various fields. However, I didn’t fit in, no matter how hard I tried. I felt disconnected and hoped there was more to life than this. A fellow veteran and colleague saw that I was struggling and shared with me the No Barriers Mindset that she had learned from Soldiers to Summits. For the first time in quite a while I was actually excited about something; I applied for the 2013 Soldiers to Summits Peruvian Andes Expedition. I still remember the phone call informing me that I was selected as a participant. It was like a when a person who’s drowning is able to grab hold of a life preserver. Although, I am deathly afraid of heights, I was determined to confront that fear. I was excited at the thought of connecting with other veterans who were struggling as I was. 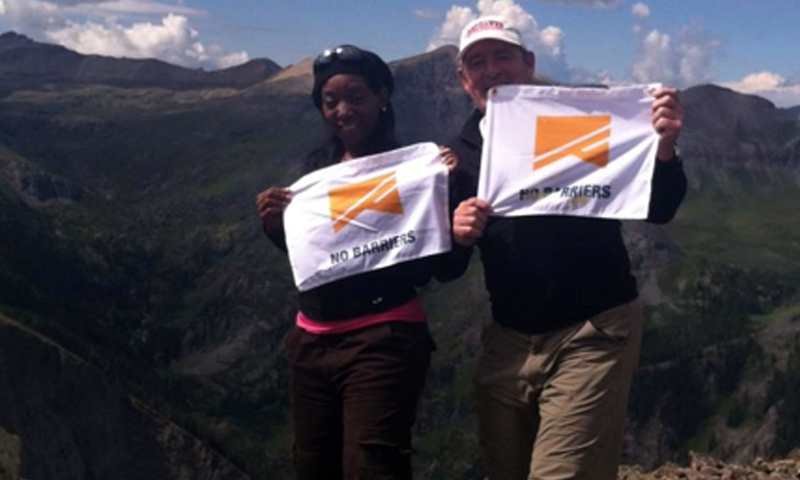 I met the other participants when we were doing our training in Colorado; our goal was to summit Mt. Ajax. My heart was in my throat as we began our trek. I actually crawled in a few precarious spots along the way, but the S2S mentors and my fellow comrades encouraged me, helping to alleviate some of the fear I felt. When we reunited in Peru for the biggest challenge yet, summiting Mariposa 1 at approximately 17,000 feet, I was a bundle of nerves. Our journey began with our guides driving us to our first drop off where we trekked eight hours in the rain, sleet and snow to a remote village with the people of Q’eros. Seeing and being able to walk with llamas and alpaca, close enough to reach out and touch them if I chose provided me with new love and respect for the outdoors and the animals found in them. The generosity displayed by the people of Q’eros was mind-boggling to me. Their living conditions were so harsh with no running water, no electricity, no television or electronics. Yet, they were loving, open and embraced us into their community whole-heartedly. There were times along the way that I didn’t think I would make it. I experienced a bout of elevation sickness and had to be carried on the back of one of the Peruvian guides for a period of time. That is, until I looked over to see how far down the fall would be. I immediately jumped down and kept pushing myself up the mountain. What S2S Did For Me? The struggles I’ve encountered dealing with PTSD/MST and heart-related issues since leaving the military caused me to become more determined to do what I can to make the transition easier for other transitioning service members. I want to become a part of the solution to the many issues we have within the surrounding community where our veterans are concerned, especially homelessness among female veterans. I want to assist with minimizing and eliminating the shame and fear that many veterans face. S2S and the No Barriers Mindset provided me with tools that helped me to overcome my feelings isolation, loneliness, and uncertainty about the direction my life was headed. I have reclaimed my sense of purpose and passion for life. I was lost, but S2S helped me find my way and my new purpose. I am now empowered and will dedicate my life to helping other veterans find their way back to living.